Santa Clara, CA | October 18, 2016: Milestone announced today that its Galexi CMS is the first in the hospitality market to launch an AMP site compatible with Google’s AMP guidelines. The website for Millwood Inn (http://www.millwoodinn.com/) in the AMP format, provides an exceptional user experience with lightning fast download speeds. It is expected that AMP pages will be Google’s preferred method of delivering content (https://www.ampproject.org/) to mobile users because they are designed to provide a significantly faster download experience compared to non-AMP mobile sites. Milestone’s Galexi™ Content Management System (CMS) comes built from the ground up with mobile compatibility and readiness at its core. AMP is no exception. Milestone customers, in fact, can already benefit from AMP compatible pages – with some already benefiting from the feature. The Millwood Inn website is an example of one such business, having launched a Galexi-powered AMP site in August of this year. Why are AMP and Mobile Experiences important for businesses? In the US, over 50% of the queries on Google come from mobile. Gary Illyes, from Google, announced last week that Google is building a new and improved index strictly for mobile. This means the speed and experience of your mobile site becomes critical for any business. AMP sites create lightning-fast, engaging mobile experiences. 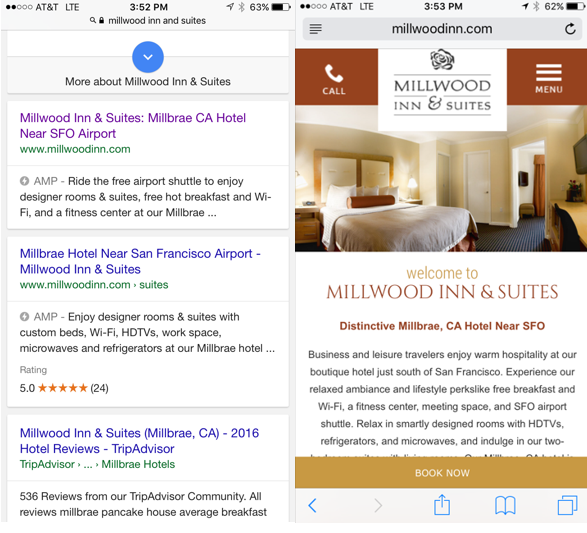 In just the first six days of the AMP site being live, The Millwood Inn has seen an increase in average position of their AMP page on Google’s mobile results, along with a 22% jump in visits and an increase in click-through rate from 14% to nearly 20%. The AMP site and Mobile site ranks on page one for all branded and non branded search queries. AMP compatibility and optimization is just the latest in a continuing trend of industry-leading innovations from Milestone. The Galexi CMS, in fact, is the premier mobile-ready CMS system available today. With full support for server-based Adaptive-Responsive design, Galexi provides the ideal mobile experience for a user’s mobile journey. Over 50% of US Google searches are now initiated on mobile devices, and nearly 20% use voice as their primary input method. Galexi allows Milestone customers to create optimal experiences for users that are designed around the way search engines work. In fact, Milestone CMS-based sites are built using topical Schema markups from over 70 different categories, enabling Google Instant Answers, high quality SERPs results and allowing Milestone clients to provide drive traffic using technologies like Google Now and Siri. In addition, add-ons like our FAQ module give Milestone clients the ability to leverage in-house knowledge and expertise to provide answers to common customer queries – right from the search engine. The Hotel Nikko in San Francisco, another Milestone client, saw dramatic results after deploying our FAQ module to power mobile initiated queries. Within six days of deployment, the hotel saw a jump of 435% in page views, a 340% lift in average sessions, as well as a 63% jump in click-through rate. Are you ready for AMP and Voice Search? Contact Milestone today to ensure that your websites are AMP ready and able to deliver the best user experience for your consumers. For more information on Milestone products and services, please contact Sara Linton, Product Marketing Specialist, at [email protected]. Visit our website www.milestoneinternet.com or call our team (408) 492-9055. Why doesn’t google think of the eCommerce sites… Or better yet, not add to the proprietary code mess? You have to use 100% of AMP js to even be considered to be used = sad panda.